Yellowstone's grizzlies are going to be particularly hungry this fall, and that means more dangerous meetings with humans in a year that is already the area's deadliest on record. Scientists report that a favorite food of many bears, nuts from whitebark pine cones, is scarce. So as grizzlies look to put on some major pounds in preparation for the long winter ahead, scientists say, they will be looking for another source of protein - meat - and running into trouble along the way. Wildlife managers already report bears coming down off the mountains and into areas frequented by hunters, berry pickers and hikers. "Pack your bear spray: there's going to be run-ins," said grizzly researcher Chuck Schwartz with the U.S. Geological Survey. Two people have been fatally mauled by grizzlies so far this year in Wyoming and Montana. Experts said that's the most in one year in at least a century for the Yellowstone region, which also includes parts of Idaho. The bears in both instances were later killed. Full-grown Yellowstone bears can stand 6 feet tall and top 600 pounds. They have been known to peel off a man's face with a single swipe of their massive, clawed paws. In the latest attack, a Michigan man was killed and two others injured when an undernourished bear and her three cubs marauded through a crowded campground near Cooke City, Mont. on July 28. A month earlier, a botanist from Cody, Wyo. was killed by a bear shortly after the animal woke up from being tranquilized by researchers. And it's not just humans at risk. Yellowstone's grizzlies were recently ordered back onto the threatened species list by a federal judge who cited in part a decline in whitebark pine. Beetles, apparently surviving winters in larger numbers due to less frequently freezing temperatures, have decimated vast stands of the high-altitude trees. In some areas studied by researchers, more than 70 percent of trees have been killed. While bears aren't starving, the loss of whitebark is driving increasing numbers of conflicts with humans. "Every year is now a bad year for whitebark pine," said Louisa Wilcox with the Natural Resources Defense Council. "We can expect more conflicts and we are getting it." Government scientists said the two fatal maulings came too early in the year for whitebark pine to have played a role. Bears typically don't start gorging themselves on the troves of pine nuts that are stashed by squirrels until mid-August. But the attacks highlighted the hazards of a region that is home to an estimated 580 grizzlies and visited by more than 3 million people a year. And officials said the maulings should serve as a warning as bears begin to push to lower elevations. Adult males will need to gain on average 50 pounds in the next few months to last through the winter. "Right now every god-dang dead cow down in this country's got grizzlies on them," said Mark Bruscino, a bear specialist with the Wyoming Game and Fish Department in Cody. "We've already had a couple of reports of bears on the gut piles of hunter-killed elk. Road-killed deer have bears on them." Hazardous encounters with humans are considered most likely outside Yellowstone National Park, in occupied areas along the fringes of the bears' 14,000-square-mile wilderness habitat. Hunters - their high-powered rifles notwithstanding - are particularly exposed because they do exactly what the experts say not to: They sneak around in the underbrush at dawn and dusk, often alone and making elk calls to lure in big game - and the occasional hungry bear. At Stillwater Outfitters near Cooke City, a mile up the road from the campground maulings, owner Mary Robison said her clients were "definitely a lot more sketchy now" about running into bears. Robison, a backcountry runner and hiker, said she had a too-casual attitude about grizzlies in the past. "Now when I'm running, every two minutes I'm yelling something or I'm singing" to warn bears of her approach, she said. While fatal encounters remain rare for humans, it is not so uncommon for bears to die after they run into people. 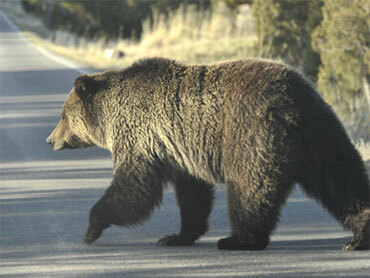 Twenty-two grizzlies are known to have died or been removed this year in and around Yellowstone National Park. Most were killed or relocated by wildlife officials because they had attacked people, acted aggressively or destroyed livestock or property. The record number of bear deaths, 79, came in 2008 - another poor year for whitebark pine.